I know a family in which two sisters live. One is outgoing and personable, the other awkward and shy. Academically, one sister is brilliant, the other, average. One sister has awards and honors that could line the most expansive room. The other sister has a trophy for Most Improved in Coaches Pitch baseball and an honorable mention ribbon from a science fair. These sisters are now both young adults. They attend the same university. And they love each other. Not only do they love each other, they ENJOY each other. They voluntarily spend time together, unprompted by their parents. It is the desire of all our parental hearts that we have children who love each other into and through adulthood, but oftentimes we find ourselves at a loss to know how to cultivate that type of sibling love. Here are a few thoughts that I hope will help you. First, allow no unkind words to be spoken in your home. Eph 4:29 tells us to “let no corrupt word come out of your mouth, but only that which is edifying. . .” If our children are to learn to love and appreciate each other, we must cultivate (and sometimes strongly enforce) the policy of affirmation and edification versus condemnation and ridicule. Children are not naturally kind and edifying. We must teach them. This means, of course, that we must employ the same policy when speaking to our children. This doesn’t mean we don’t correct them. It simply means that every word we share with them is spoken in love (Eph. 4:15). Second, teach your children to rejoice and sorrow along with their siblings (Rom. 12:15). Make a point to have ALL the family there at baseball games, awards ceremonies, school plays. This becomes more difficult as children get older, but it is an amazing bonding experience when siblings share in one another’s trials and triumphs. Another way to help build relationships among our children is to encourage shared friends. Plan get-togethers with whole families, not just individual play dates. You may be surprised to find that you have developed some special friends along the way, too! Finally, speak words of vision into each of your children within each other’s hearing. Rather than complain about their differences, embrace them. Never try to make one child fit into the other’s mold. Say, “Johnny, you are such a good listener (instead of “You are so quiet and shy.”) Maybe one day you will be a counselor to help people with their problems.” The Lord did this as he commissioned Gideon in Judges 6:12. Instead of pointing out that he was fearfully hiding from his enemies in the dark, He called Gideon “Mighty Warrior,” because He knew what Gideon would one day become a brave leader. God has created each of our children with special gifts and talents. It is our job to help recognize them, celebrate them, and draw them out. As we affirm these differences, our children hear these words of vision, embrace them for themselves, and learn to value the differences in their siblings that could otherwise be frustrating or challenging. Love doesn’t naturally grow. It must be cultivated. God bless you as we teach our children the second greatest commandment, to love one another! 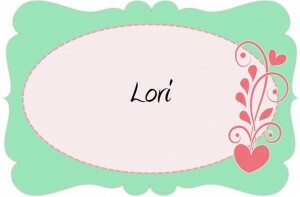 You can find Lori’s bio here. If you’re in the Roanoke, Virginia area in April, Lori will be presenting her seminar “Praying with Power,” at New Century Church on April 18-19. For more information, click here. We try to cultivate multi-age friendships as well…because that’s how “real life” is! Oh yes, real life isn’t about friends our own age LOL! Not even marriages for that matter, such is my case! Great advice for cultivating sibling friendships! We are in this stage with our kids now. I loved the “blessing” spoken to them – this is something that I’ve been wanting to learn more about. Thank you for linking up to Inspired Wednesdays! Being intentional to choose life-giving words is SO important, isn’t it? Unfortunately it’s something I often overlook. Thanks for the reminder! Such great (and do-able) actions – I especially love the suggestion to speak a “vision” for one in the hearing of the other. I imagine this would work for every relationship. Isn’t it amazing how things in each relationship really apply to all relationships? Thanks for stoppin by!